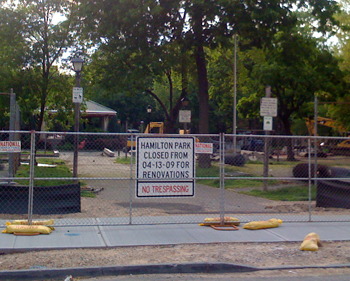 Renovations have begun at Hamilton Park, just in time to close it for summer. 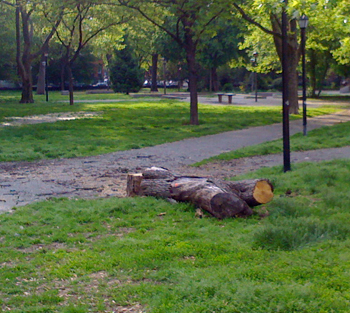 Construction crews have slashed a half dozen large trees with 18 inch diameters, casualties of low bid contracts. 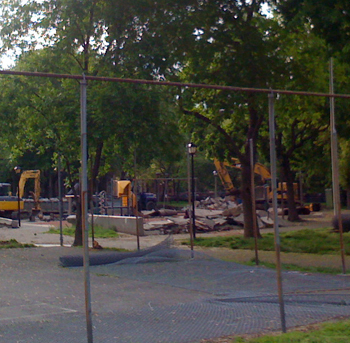 The renovated park will include an expanded playground, two dog runs, and renovated ball courts. In addition, the historic pathways will be reinstalled and Victorian style lighting. About half the park will remain grassy fields. The dog runs caused a controversy among residents. For several years, dog owners have been illegally allowing their dogs off leash on the grassy areas of the park. Not only did many park goers feel the illegal activity was unsafe, but the dogs also destroyed the grass. As plans for the renovation were drawn up, two dog runs were included in the design, one for large dogs and one for small dogs. Four final plans were drawn up and community residents voted on the plans; the selected plan included a smaller allotted space for the dog runs. 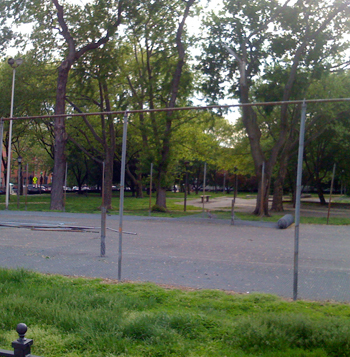 Moreover, the selected plan divided the dog run space in half, with two roughly equal sized runs for small and large dogs. Large dog owners pointed out that larger dogs needed more space than smaller dogs. Part of the controversy stemmed from the way the the park’s plans were voted on. The final vote was suppose to only be about the layout of the park renovation, not the amenities. However, one of the designs included a small putting green, while another design did not; both these designs were otherwise identical, and both were the only design where the two dog runs abutted against each other. Proponents of the dog run claim the two virtually identical designs split votes allowing the chosen design to win. Meanwhile, the park was originally to remain at least partially open during renovation. However, the contractor insisted on closing the entirety of the park during renovations, meaning the park will be closed for much of the summer. 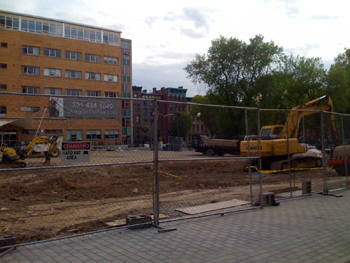 However, local developer Exeter Property has volunteered a lot adjacent to the park to serve as a temporary playground. 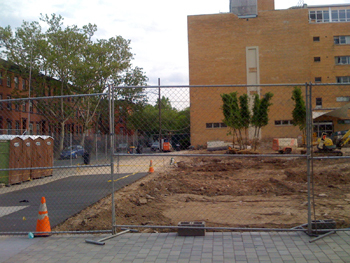 The playground should be open by June. Exeter Property, developer Hamilton Square, a project adjacent to the park, has promised a temporary playground on land that will one day be a small residential building.